Get Ready for Hearthstone® Esports in 2018! 2018 is almost upon us, which means it’s time for a new year of the Hearthstone® Championship Tour! Here are the details about what’s changing for Hearthstone esports. This year was one of amazing growth for the Hearthstone Championship Tour (HCT). But there is still work to be done! We’re very excited to share some key changes we’re making for the coming year. 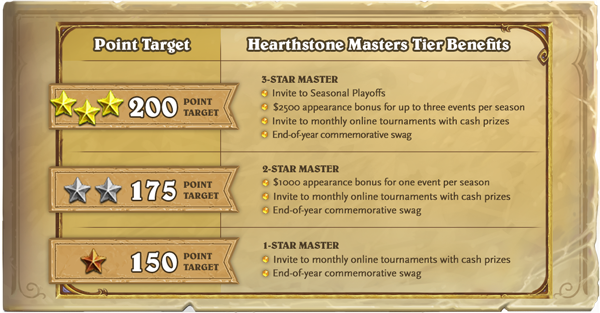 The Hearthstone Masters System will recognize top players based on the consistency of their performance. There will be three tiers, with rewards for eligible players increasing at each level. 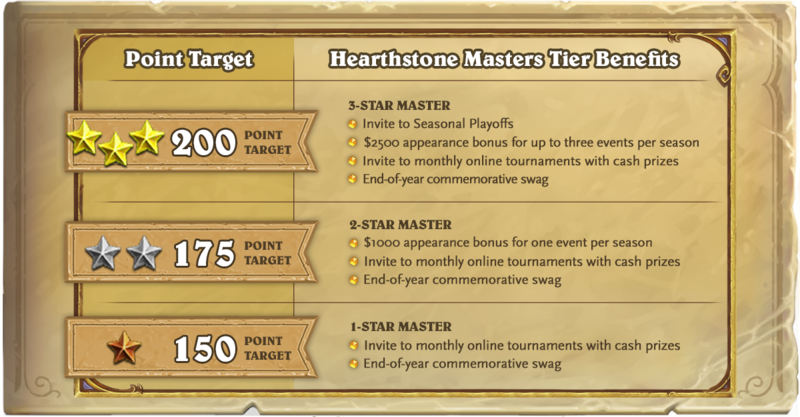 The 1-, 2-, and 3-Star Master tiers offer tournament appearance bonuses, invitations to HCT Playoffs and online Blizzard-run tournaments with cash prizes, and special commemorative memorabilia. A player’s tier will be determined using the rolling sum of their point totals over the most recent three HCT seasons. Players must hit a point target to be granted or to maintain their status. Status levels are recalculated on the last day of each HCT season, so your tier benefits will last for four months. In 2018 we are streamlining the Hearthstone Championship Tour to create more earning potential for competitors, improve qualification systems for established pros and aspiring competitors, increase staffing and infrastructure support for Playoffs, and hold more global Tour Stops! Each HCT season will now have a point target, which will be announced before that season begins. All players who earn at least that many points will qualify to play in the seasonal Playoffs. 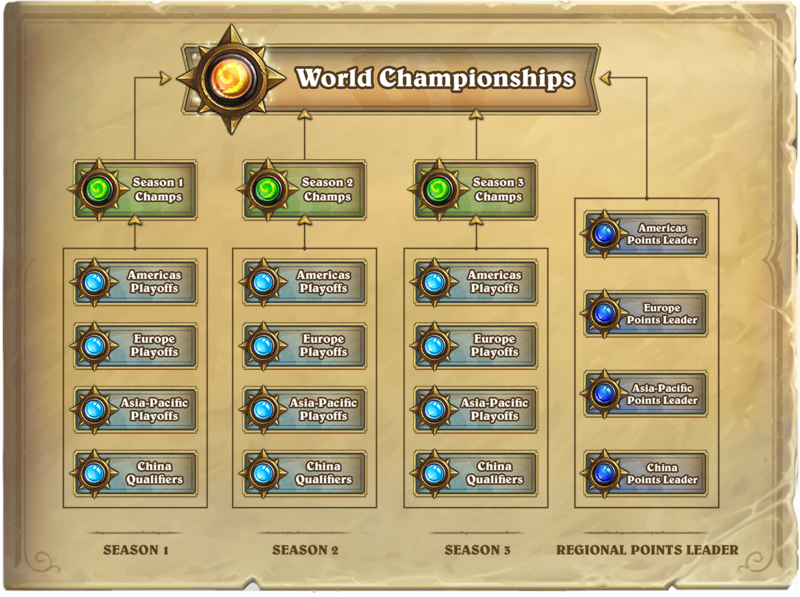 Players can earn points from events in all regions, and then compete in Playoffs based on their country of residence. The target for Season 1 is 45 points for all regions, with targets for the following season announced two weeks before it starts. As we progress through the year, points targets may be scaled by region. The HCT Last Call qualifying player—based on a player’s total points earned for a year’s three HCT seasons—will now be known as the Regional Points Leader. 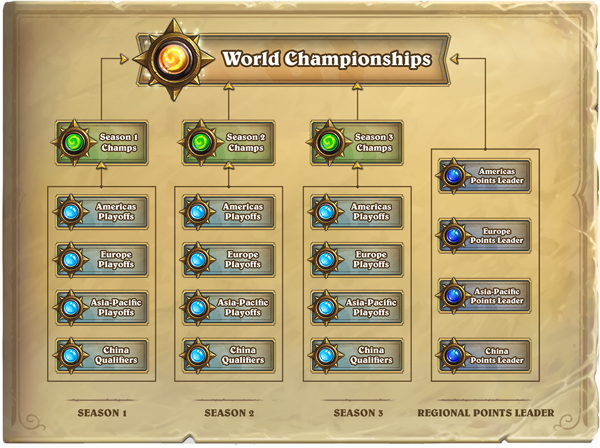 The Regional Points Leader will still earn an invitation to the HCT World Championship, and top players in each region will receive cash prizes. Please also bid a warm welcome to the Hearthstone Challengers program, which will qualify eight players to Playoffs each season. This program will combine online cups and the existing Tavern Hero Qualifier to provide a more streamlined path to the Playoffs for aspiring players. Online cups will now be known as Challenger Cups, while the Tavern Hero Tournament will become the Challenger Finals. Tavern Hero Qualifiers will still exist as a pathway to the Challenger Finals. The Hearthstone Challengers program is only open to players who have not qualified for Playoffs for three consecutive HCT seasons. In 2018, we’ll be changing up the amount of Hearthstone Competitive Points (CP) awarded for ladder finishes and tournaments. Starting in January 2018, a player’s three best ladder finishes per HCT season will count towards their point total. We want to avoid players being disadvantaged when they compete at an event that occurs toward the end of a month, when everyone is trying to reach the highest possible ladder rank. * The top four players at seasonal Playoffs will play at Championships, and earn a minimum of 12 points for placing 9th through 16th at the Championship they compete in. December 2017 is an offseason, and will not count toward point totals for competitive Hearthstone in 2018. To maintain the accessible, distributed model for HCT Playoffs, we will be increasing on-site staffing and infrastructure support for Playoff venues to ensure everything runs smoothly. We will have fewer total Playoff venues per region, but that means that each venue will be built up for competitive play, with stable internet connections and a more controlled competitive environment. We’re increasing the number of international tournaments in 2018 with HCT Tour Stops, which will put the “Tour” in the Hearthstone Championship Tour and travel across the globe! With increased Competitive Points, prizing, and the opportunities to experience new sights and cities, we hope to see you at an HCT Tour Stop next year. More information on the full Hearthstone Championship Tour program will be provided in the Official Rules, which you can find at the bottom of this blog. Teams and organizations are a vital component of Hearthstone’s esports ecosystem. Starting in Season 2 of 2018, we’ll be awarding cash incentives to players from the top 10 Hearthstone teams per HCT season. Teams will be able to choose three players to represent them, with the choices being set for a full HCT season. At the end of each season, the top 10 teams on our Pro Team Standings Leaderboard will receive a cash prize based on the combined seasonal point total of their three team members. See all of the new information in our 2018 Hearthstone Esports Visual Guide! We hope you’ve enjoyed this first look at 2018’s Hearthstone Championship Tour. We’ll have many more details to share as we kick off the new year. In the meantime, we’d love to hear your feedback as always. Hit us up on the Hearthstone Esports Twitter and Facebook pages with your thoughts!